Morocco is largely a tourist economy, so there is every kind of lodging available. Hotels range from multinational French chains to American chain hotels to private hotels. One can find two to five star hotels in each category; however, the privately owned Moroccan hotels can indeed also be the most luxurious. If one is looking for a more modest hotel, one does best to stick with the chain hotels; they tend to be cleaner and better maintained. All hotels offer the usual amenities of private bathroom, parking, room service and laundry, and in the more sumptuous hotels there may be a casino and a pool. 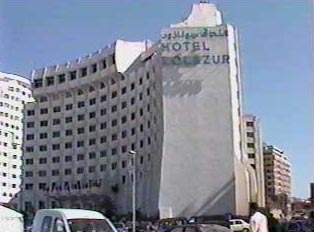 What is called a motel in Morocco resembles a pensione insofar as one is only renting a single room, often in a house. Although less expensive, motels are often located in less desirable neighborhoods, tend to be less clean, and sometimes slightly unsafe. In a motel, one has the option of a shared or private bath. One would opt for the private bath. Agencies are available to rent apartments by the month, week, or day. The cost depends upon what kind of property is rented, which can be anything from a simple pied-à-terre to a villa replete with house, garden and swimming pool. Whatever one chooses, the cost is low relative to western standards. "I Would Like to Make a Reservation"
"Do You Have Apartments for Rent?"